Here we are yet again traveling during the holidays and not home for Christmas with our families. This is actually our third Christmas in Thailand, our first Christmas in Thailand we convinced Hannah’s parents to come. We haven’t convinced them to make the 8,000-mile journey again, but that doesn’t mean we spent Christmas alone. Like our last Christmass in Thailand, today we’ll celebrate with other roaming nomad friends. Thailand does a really good job of trying at Christmas! However, as the famous Thailand saying goes, it’s “same same but different”. If you haven’t heard that saying it basically means it’s similar but VERY different. We decided to film our Christmas week here in Thailand just to give you a glimpse of what Christmas in Thailand is like. Instead of Christmas gifts we each got a Sak Yant tattoo a gift that will last a lifetime. Here is how we spent our Christmas in Thailand. The holidays are a great time to get away and travel. For most, it’s a way to take a long vacation without burning up all your vacation days. This year the way Christmas and New Years fell you could easily take a two-week vacation and only use 8 days of paid time off. We’re all about taking as many vacations as possible. 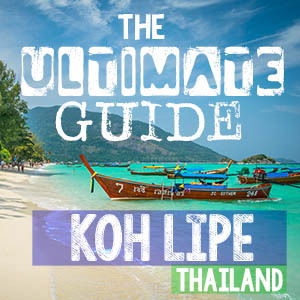 Make sure to check out our Thailand travel tips article before packing your bags! Who says snowman have to be made out of snow? What’s The Best Place In Thailand To Spend Christmas? Well, this is a tricky one, as there are so many great places to visit in Thailand. We are from cold and snowy Wisconsin where it is normally below freezing and several inches of snow on the ground during the holidays. So, we would prefer to spend Christmas on the beach as it is the complete opposite of Wisconsin. Thailand at Xmas time is everything someone who grew up with freezing cold white Christmases dreams about. Are there Christmas Trees in Thailand? Yes, every mall in Bangkok will be decked out with Christmas trees and decorations. All major tourist destinations the hotels and malls will have something set up. Even my nail salon in Chiang Mai had a Christmas tree with ornaments that customers picked to reveal a discount or free service. Do Restaurants Offer Classic a Christmas Dinner? Depending on where in Thailand you are yes they do. In larger cities like Bangkok and Chiang Mai, several restaurants that cater to tourists and expats offer a holiday meal. In Chiang Mai, the restaurant Dukes has a holiday buffet that has all the classic American Christmas dinner dishes for $40. If you are traveling to some of the Thailand Islands many resorts have a mandatory Christmas dinner for all guests. Make sure to double check this before booking as you will have to pay for this meal no matter if you want to partake in it or not. We spent one of our Christmas’s in Thailand down in Koh Phi Phi and made sure to pick a hotel that did not make us pay for their holiday meal. Are There Christmas cookies in Thailand? Bakeries will have specially decorated cookies with angels, Santa, snowflakes, snowman, etc. Our local grocery store even had huge gingerbread cookies, gorgeous holiday themed cakes and my favorite cupcakes. If you are ambitious and are renting an apartment from Airbnb you can easily bake your cookies. I was able to find all the necessary ingredients, basically, you can get everything you need it just sometimes is a little pricier than at home. If you are staying in an apartment without an oven don’t worry you CAN make cookies in a rice cooker. Trust me, I did! It may only bake 5 cookies at a time but it does the job. You can see the proof in the video above. Airbnb first-timers, if you sign up to get a $40 credit when you book your first trip! –>> sign up here! Will there be a Santa in Thailand to visit? We did not see any places in Chiang Mai where they had Santa and his elves for Children to sit on his lap and take pictures. However, I wouldn’t be surprised if there was a Santa station set up in some of the Bangkok shopping malls. Do Thai’s Give Christmas Gifts? It is not part of their culture to give gifts, but don’t be surprised to see the locals joining in on the holiday. Yes, just today in my Chiang Mai condo building I saw several local Thai people carrying wrapped Christmas gifts out to their cars. The grocery stores have an insane amount of Christmas baskets from fruit baskets, American import food products, Chocolate boxes, you name it. If you are traveling with children and want “Santa” to bring gifts to your room, I am sure the hotel can help arrange this. Christmas wrapping paper and ribbons can be found easily. If you can’t find it just ask the hotel where to get some, odds are they might just get some for you. This is the land of smiles remember. Well no not technically. Christmas in Thailand is mainly for the tourists and expats living in Thailand. However, Christmas is celebrated across Thailand as who doesn’t love the pretty decorations and giving gifts? Bangkok Christmas is the most elaborate, the fancy mall really do a great job. Is the Christmas Music in English? Yes, the Christmas music will be the same classic music you are familiar with back at home. In our local mall Maya Chiang Mai, they had a choir singing Christmas carols all in English. You actually won’t even detect an accent with their singing. Traveling during the holidays can be tough, as we would all like to be with our friends and family to celebrate them. Over the last 4 years, we have missed 3 Christmases back in Wisconsin. Now with Skype, we are “there” to watch presents get opened and even there for my grandpa to offer me a cookie…which isn’t nice when we are 8,000 miles away! Spending Christmas in Thailand we do get a little bit of a Christmas fix, with the decorations, music, trees, restaurants. But honestly, it will never be the same as being home with our family. Great energy in the video guys! Loved it. And LOL on the guy in the fat deer costume, with the dangling thingee. We spent 2012 Christmas in Chiang Mai and dug it big-time. The Thai do their best to make it feel like Christmas and our preferred digs – Chiang Mai Riverside Condo – is so packed with American expat farang that the place has a tree with presents and decorations all over the place. Feels super seasonal too in CM since temps can drop into the 50’s at night during this most pleasant time of year. I recalled walking outside at midnight, before Christmas, wearing my ski cap, sweats and scarf, wandering around in a jet-lagged daze and picking from the many food stalls open thru the night. Thanks Guys 🙂 Missing CM tons, gotta get back! Yeah at night it is chilly here in the 50’s. Living on Nimman I swear I see more Farangs that Thais some days. We spent Christmas 2013 in Phi Phi and 2014 & 16 in Chiang Mai. I’m living in Japan now and your “same same but different” explanation is bang-on for here too. Funny how these countries pick up on certain aspects of western holidays and make it their own! In Japan, people eat KFC for Christmas dinner and the stores dress up Col. Sanders statues in a Santa outfit. Same same but different 🙂 Merry Christmas! Sanders in a Santa outfit?!?! So jealous you are in Japan, it is at the top of our bucket list. What part of Japan are you in? For last 7 years I have been spending my Christmas in different countries. And believe me, it’s such a fun to see different versions. Where did you spend Christmas this year? We still don’t know how we have managed to be in Thailand now for 3 Christmases..who knows where we will be next year. I love learning about how other countries celebrate Christmas. This reminded me about how Japan celebrates Christmas. Well, same same but different 🙂 I grew up in Japan and we have all the Christmas decor and the stores have special Christmas things etc, but it is still quite different from the American Christmas. Good to know Japan puts on a good Xmas show too. We hope to get to Japan in 2017. What part of Japan did you live in? Haha I was waiting to hear about those rice cooker cookies! I’m impressed! Glad they turned out, 5 is better than none! True 5 is better than none! I would def make rice cooker cookies again. I’ve spent Christmas in Thsiland a couple of times. It never occurred to me about Christmas cookies etc because if you a rebound somewhere different then it wouldn’t be the same. Otherwise why go away in the first place? I love my Christmas cookies, so I had to at least try and I was surprised they turned out perfect. Thanks Meg! Hope you had a great Xmas in Australia. If you ever make it to Thailand I’ll make you rice cooker cookies.